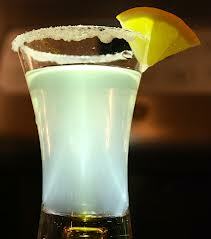 FRIDAY COCKTAIL - SUMMER RUM LEMON DROP SHOOTER! Well I am late today with my Friday Cocktail - so Let's just get to IT! This sounds awesome, but a few may go a long way.......TGIF! In a shaker with ice add 1/2 ounce of Bacardi Limon Rum and shake until the shaker is cold. Strain into a shot glass. Garnish with a sugar coated lemon wedge. Just a Fabulous Start to the SUMMER! FRIDAY COCKTAIL - THE SWEATY HIPSTER!! If this was Sam's blog, he would use the recipe for a Hipster cocktail from the Urban Dictionary. "Take your favorite cocktail and microwave it for 30 seconds and drink it before it cools!" Bring all to a boil, stir until sugar is dissolved. Let cool. Strain repeatedly until all chile and mint pieces are strained out. Store in your frig. Mix all liquid ingredients in a shaker with ice. 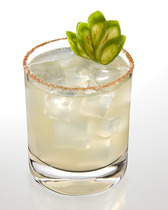 Use chile salt to rim a rocks glass. Strain the shaker into the rocks glass with ice and garnish.